Brodhead Memorial Public Library Board members at the ribbon Cutting ceremony at open house, May 17, 2009. Left-right: John Walker, Diane Anderson, Shelly Kuhl, Marilyn Saunders, Mary Share, Carol Pawlisch and Jerry Elmer. 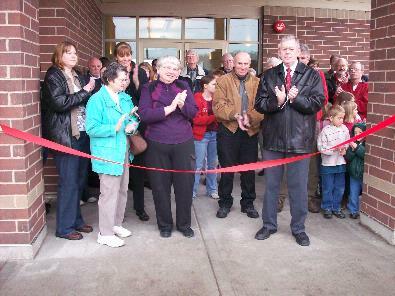 The new Brodhead Memorial Public Library opens to the public--2 months ahead of schedule! Mayor Doug Pinnow does the honor of cutting the ribbon and opening the doors to the public. City Council approves starting the library building project by borrowing $1 million from the Sugar River Bank and Bank of Brodhead . The building contract was awarded to Roberts Construction Company of Madison, WI. Advertisement for bids for the construction of the Memorial Public Library published May 14 and May 21, 2008. Begin looking for building sites. Members of the board began gathering information on five possible site in the downtown area. Because of clean-up costs or other major factors such as lack of parking, size, or unavailability, these sites were not included in final selection. Other properties were also investigated and evaluated from the Century Satellite building, property on County T, city-owned property on the race, etc. Finally, in 2002, the choices have been narrowed down to three--present location at 902 W 2nd Avenue, one acre located on 25th St., and one acre located on 21st St. behind McDonald's. Library Endowment fund was approximately $32,600 at the beginning of 1999. Library Board designated this as the Library Building Fund. As of November 2002 the fund has reached in excess of $84,000. On-going efforts are being made to increase this fund. Strategic Long Range Plan, 1999-2001 was presented to library board members: Carol Badetscher, Ronald Ertner, Carol Maveus, Carol Pawlisch, Mike Searls, Mary Share, and Donald Witte for suggestions, corrections, and approval. Plan was completed and copies were given to Brodhead City Council members and Mayor. In December, a list of twelve needs of the Brodhead Public Library was compiled. This included such items as high noise level, lack of electrical outlets, lack of storage space, unsafe working conditions, need for more shelving, tables, program area, etc. A planning team consisting of Jim & Marcia Caldwell, Darlyne Dillon, Ted and Gabrielle Douglas, Dan Markham, Linda McGinty, Donna Olson, Carol Pawlisch, Jon Plast, Brielle Schlittler, David Searles, Don Witte, and Gloria Rosa held a series of three meetings under the direction of Dr. Pat Lund to develop a strategic long range plan for the library.